Indoor farms run by AI and lit by LEDs can be more efficient than field agriculture, but can they significantly reduce greenhouse gas emissions? 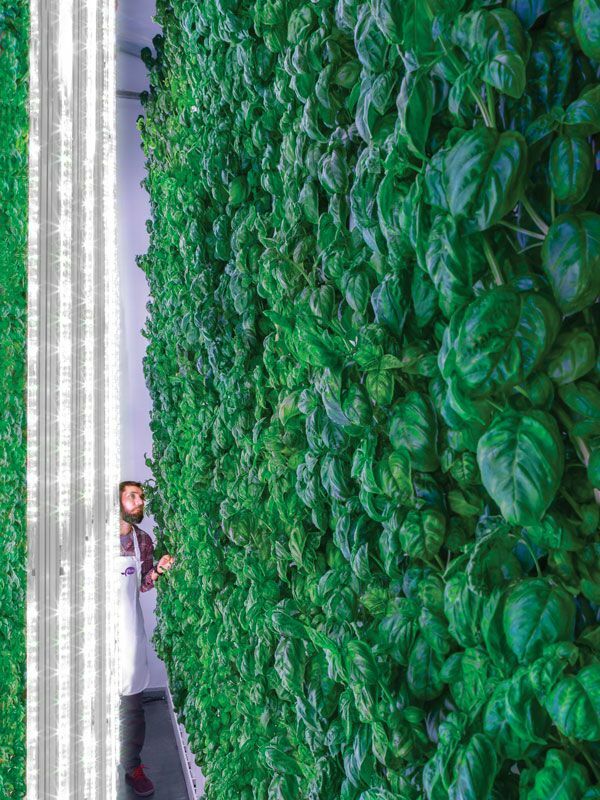 Wall of Plenty: A wall of basil is bathed in light from LED tubes, which are optimized for this particular crop by Plenty’s proprietary machine-learning algorithms. What Will the Food Miracle Be? I emerge from the Tokyo Monorail station on Shōwajima, a small island in Tokyo Bay that’s nestled between downtown Tokyo and Haneda Airport. Disoriented and dodging cargo trucks exiting a busy overpass, I duck under a bridge and consult the map on my phone, which leads me deeper into a warren of warehouses. I eventually find Espec Mic Corp.’s VegetaFarm, in a dilapidated 1960s office building tucked between a printing plant and a beer distributor. Stepping inside the glass-walled lobby on the second floor, I see racks upon racks of leafy green lettuce and kale growing in hydroponic solutions of water and a precisely calibrated mix of nutrients. Energy-efficient LEDs emit a pinkish light within a spectral range of 400 to 700 nanometers, the sweet spot for photosynthesis. I’m here to find out how plant factories, called vertical or indoor farms in Western countries, can help reduce the greenhouse gas emissions associated with conventional field agriculture. According to the World Bank, 48.6 million square kilometers of land were farmed worldwide in 2015. Collectively, agriculture, forestry, and other land uses contributed 21 percent of global greenhouse gas emissions, per a 2017 report from the Food and Agriculture Organization of the United Nations, mostly through releases of carbon dioxide, methane, and nitrous oxide. Vertical farms avoid much of these emissions, despite the fact that they rely on artificial light and have to be carefully climate-controlled. Indeed, according to vertical farms evangelist Dickson Despommier, who’s widely credited with taking the fledging industry mainstream, these kinds of farms could significantly reduce the amount of land devoted to farming and thereby make a serious dent in our climate change problem. But how realistic is it? Determining what contributes to agriculture’s share of overall greenhouse gas emissions is fairly straightforward. Paul West, codirector and lead scientist of the Global Landscapes Initiative at the University of Minnesota’s Institute on the Environment, says that half of agriculture’s share of greenhouse gas emissions comes in the form of carbon dioxide from clearing forests for cattle and soy in South America and for oil palms in Southeast Asia. Another huge chunk comes from livestock and rice paddies, which release staggering quantities of methane. Nitrous oxide from fertilizer accounts for a good portion of the rest. Working the (Indoor) Farm: A bunny-suited farmer wrangles trays of frill lettuce toward harvest in Espec Mic’s VegetaFarm. I ask West whether vertical farms could help. He notes that the vast majority of calories produced on cropland come from grains like wheat, rice, corn, and soy, none of which are particularly good candidates for indoor farming. And it’s true—I don’t see any rice, wheat, corn, or soy growing at the VegetaFarm in Tokyo. Instead, the 160-square-meter space is filled with a fecund profusion of leafy greens. The farm produces 1,000 heads of lettuce per day, according to Shun Kawasaki, production manager and plant scientist. To enter the farm, Kawasaki and I don clean-room bunny suits, face masks, and rubber boots, step on a sticky mat, walk through an air shower, and exit into the plant room. Each of the six racks holds five tiers of water-filled canals on which float rafts of plants. Two bunny-suited workers tend this indoor garden, occasionally pushing a new tray of seedlings onto one end of a shelf and another ready-to-be-harvested tray off the other. Through his mask, Kawasaki tells me that besides controlling temperature, the HVAC ducts and fans snaking under the shelving also pump in carbon dioxide to keep levels at about 1,000 parts per million, about two and a half times the typical outdoor level. Trays of lettuce and kale soak up light from LED tubes, which stay on for 16 to 17 hours per day and use up to 70 percent of the 600 to 700 kilowatt-hours consumed per day. 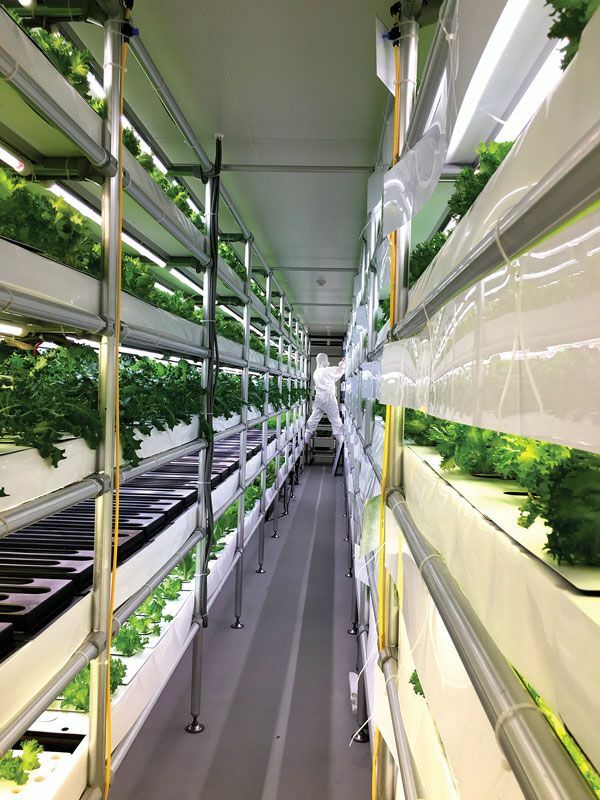 If you have US $1 million, you can buy a medium-size VegetaFarm like this one from Espec Mic, including the racks, control systems, HVAC, and lighting. Besides the lettuce and kale, the Tokyo farm grows bok choy, mint, mizuna, and shiso, and is experimenting with basil and radishes. Lettuce grown in the field takes about 60 days from seed to harvest. In the VegetaFarm, it takes 40 days. Other plant factories claim faster rates, in the 30-day range. So instead of one to three harvests per year on a conventional farm in the middle latitudes, a plant factory can produce one harvest every month or so. And unlike field-grown lettuce, which is harvested all at once, the indoor harvest is continual and the yields extremely high, with no loss from pests or inclement weather. Succulent Greens: Grown indoors under LEDs with sea water pumped up from 800 m deep, Mineraleaf lettuce is delicious and loaded with nutrients. After the tour, Kawasaki gives me a sample of Espec Mic’s Mineraleaf green lettuce, freshly harvested and packaged on-site that day. One of the major benefits of plant factories is that you can tune the plant’s chemical composition to engineer its nutrient content and flavor profile. The company grows its Mineraleaf lettuces in seawater pumped up from 800 meters, which makes for a tender, delicious leaf—maybe the tastiest lettuce I’ve ever had—that’s also dense in calcium, potassium, and magnesium. A 100-gram package sells for about 200 yen (about $2). On the package, where you might expect to see an image of a lush field or the Jolly Green Giant, there are photos of plants basking in pink light. Proponents of urban indoor agriculture tout a number of benefits—such as increasing city dwellers’ access to fresh produce and revitalizing rundown warehouse districts. But the most audacious claims center on indoor farms’ environmental benefits over those of conventional field agriculture, including the elimination of pesticides and much more efficient use of water. According to Toyoki Kozai, professor emeritus at Chiba University and president of the Japan Plant Factory Association, plant factories use water 30 to 50 times as efficiently as a traditional greenhouse does. Many plant factories don’t even wash their produce. Instead, as at VegetaFarm, harvested plants go straight into packaging, and they’re clean enough to eat. Kozai says that a vertical farm is most economically viable when its output is consumed fresh within a few kilometers of the farm itself. That cuts down on fuel for transportation and processing as well as the loss of produce en route to the consumer. Certainly, Japan’s vertical farming industry is still tiny, despite being around for several decades. Eri Hayashi, director of international relations and consulting at the Japan Plant Factory Association, says there are 182 plant factories in Japan. One of the largest is Spread Co.’s Kameoka plant near Kyoto. Its two 900-m2 towers have a total cultivation area of 25,200 m2 and produce 21,000 heads of lettuce per day. Later this year, Spread will open the Techno Farm in Kyoto, which the company says will exploit advanced automation to more than double productivity, to 648 heads per square meter. LEDs Are Key to Growth: The Japan Plant Factory Association runs a prototype plant factory on the Chiba University campus. Here it researches different crops as well as lighting systems from the likes of Advanced Agri, Future Green, Kyocera, Philips, Showa Denko, and Toshiba. According to a 2014 market study [PDF] by the Yano Research Institute, total revenue for the Japanese vertical farm industry was 3.4 billion yen ($31.2 million) in 2013. Japan’s domestic market for vegetables that year was 2,253 billion yen, according to the Statistics Bureau of the Japan Ministry of Internal Affairs and Communications, which means that vertical farms accounted for a scant 0.15 percent of the country’s vegetable market. Still, interest in vertical farms has never been higher. Outside of Japan, the most active markets are China, Taiwan, and the United States, Hayashi says. As the concept has spread, new hybrids have sprung up. These include indoor aquaponics farms, where fish poop fertilizes the plants, and the “aeroponics”⁠-based AeroFarms in Newark, N.J., which employs proprietary spray nozzles to mist plant roots with water and nutrients. A recent white paper by investment firm Newbean Capital counted 56 commercial warehouse, aquaponics, and rooftop greenhouse farms in the United States in 2017, up from 15 in 2015, and notes that at least three 6,500-m2 farms are under construction. Over the Rainbow Chard: A worker tends to double-sided walls of rainbow chard at one of Plenty’s facilities. Tubes of LEDs tuned for these specific plants light the leaves from multiple angles, something conventional vertical farms are now starting to experiment with by lighting the leaves from beneath as well as above. Plenty has attracted $200 million in investment from SoftBank chief Masayoshi Son’s Vision Fund as well as from funds that invest for Amazon’s Jeff Bezos (who also owns Whole Foods), Bloomberg.com reported. With Bezos involved, Plenty could be positioned to do what no other indoor farming company has been able to do so far: grow produce indoors on a global scale. Plenty’s betting big on a suite of technologies that Storey believes can usher in a new era of farming, one powered by renewable energy and lit by LEDs, with sensor networks collecting tens of thousands of data points that feed into machine-learning algorithms to optimize growing conditions for particular plants at specific stages of their life cycle. Plenty will start with greens and herbs, but in the next 12 to 18 months the company intends to branch out into fruits that until now have been grown indoors only experimentally. “I think that the industry as a whole will be surprised at the speed with which we begin to introduce crops that have historically only been viable in the field,” Storey says. Vertical farms are fine for growing leafy veggies, but not for displacing hundreds of millions of hectares of grains and legumes that feed the world. But can superfresh lettuce save a forest? Despommier’s thesis relies on converting farmland back to hardwood forest. To free up 881,000 km2 of land, you’d need an area equivalent to Spread’s 25,200-m2 Kameoka plant multiplied by 35 million. Despommier’s vision for skyscraper-scale vertical farms coupled with much shorter growing seasons could certainly cut that number from millions to tens of thousands, but even an optimist can’t imagine such a building boom within this century. And in the unlikely event such a boom were to ensue, you’d be getting only a small percentage of the vegetables and fruits grown on traditional farms and none of the wheat, corn, soy, or rice, at least not in the foreseeable future. Nor will vertical farms raise livestock or grow oil palms, which are mainly what people are clearing hardwood forests to make room for. If not kale, then what? Neil Mattson, an associate professor of plant science at Cornell University, in New York, has been looking into which crops make the most sense to grow indoors. He’s the principal investigator on a $2.4 million grant from the National Science Foundation, and he and his team are analyzing how plant factories stack up against field agriculture “in terms of energy, carbon, and water footprints, profitability, workforce development, and scalability.” It is probably the best-funded, most comprehensive study on indoor farms to date, one that will help quantify how much they can mitigate climate change. Mattson notes, for example, that it makes no sense to grow wheat indoors. His Cornell colleague Lou Albright looked at the lighting costs of vertical farms for a 2015 presentation [PDF], and he calculated that if you grew wheat indoors, just the electricity cost per loaf of bread made from that wheat would be $11. “Lou Albright would say indoor production like that doesn’t really make sense until you get completely renewable energy,” Mattson says. For its part, Plenty is committed to integrating renewable energy sources into its power mix. The Seattle facility will source hydroelectric power. But to make a dent in, say, methane emissions by moving rice cultivation indoors, the amount of renewable energy you’d need would be truly massive: Of the 48.6 million km2 of land being farmed, 1.61 million km2 are devoted to rice cultivation. It may well be that before that future arrives, we’ll be growing more of our food in plant factories. Will it be the 10 percent that Despommier hopes for? Even if plant factories and vertical farms wind up being only a small part of the overall solution to reducing greenhouse gas emissions in the near term, they might be our insurance policy. As climate change starts to erode the viability of croplands, we may be forced to grow indoors, where the climate is still under our control. Harry Goldstein’s adventure in vertical farming began at the deserted Shōwajima monorail station, on an island in Tokyo Bay. Goldstein, IEEE Spectrum’s online editorial director, had an hour before his appointment to tour the Espec Mic VegetaFarm plant factory. It was a warm, sunny afternoon on the first day of March. But where was the farm? It wasn’t vertical enough to be visible from the train platform. Fortunately, he’d downloaded a PDF map for just this eventuality. The building itself was a bit of a disappointment. The term “vertical farm” is richly futuristic, conjuring visions of green towers gleaming in the sun. But the VegetaFarm turned out to be a shabby office building with Espec Mic’s sign hanging on an ornamental gate out front. After a brief, mostly gestural exchange with a janitor, Goldstein was escorted into the grow room, an eerily quiet, moist, warm warren, like a library with plants instead of books. Having heard that some plant factories require workers to shower before entering the grow room, he was relieved that the only clothes he had to remove were his shoes and that he needed only a shower of puffed air to dust off the bunny suit he had to put on. When the tour ended, Goldstein took the stairs down. On a landing, he snapped his last picture: a ladder leaning against a window, a mop propped next to it, a pair of men’s trousers slung over a middle rung. He stealthily rounded the next corner and slipped through the empty lobby, avoiding the half-naked janitor the tableau suggested. A correction to this article was made on June 5, 2018.